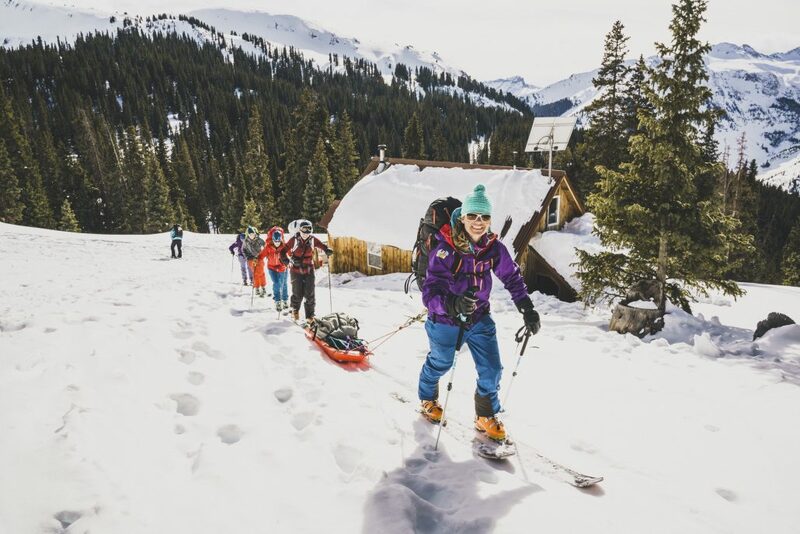 Join Chicks and the Silverton Avalanche School on Red Mountain Pass for 3 days of backcountry skiing or riding and 2 nights at the easily accessible St Paul Lodge. 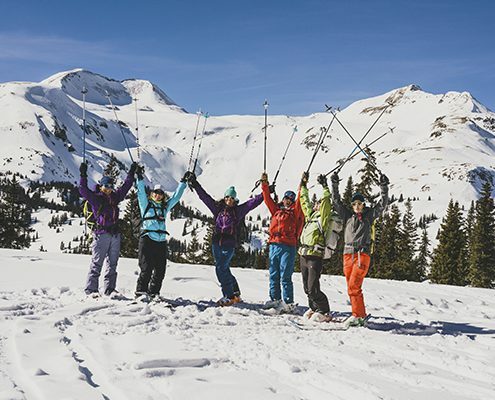 Under the guidance of our IFMGA/AMGA guide, PSIA and Avalanche Instructor you’ll learn the ups and downs of backcountry skiing in a setting that is perfect for anyone that can ski blue runs on-piste. You’ll gain a solid foundation of basic winter travel skills, safety, and avalanche rescue fundamentals as well as tips and coaching to ski well in a variety of backcountry conditions. 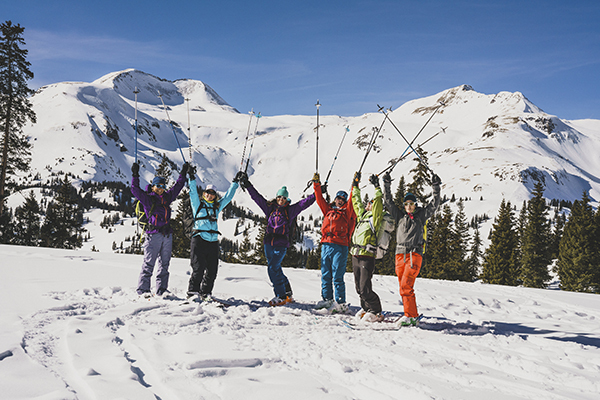 This clinic is ideal for women who love to ski, are curious about venturing into the backcountry and want to get a feel for it in a supportive, fun environment. The St Paul Lodge is a comfortable backcountry ski hut located on the lower slopes of MacMillan Peak, complete with a wood burning stove, BBQ grill on the deck and all the essentials to kick back after a day out in the mountains. The Hut Chef will prepare breakfasts and dinners giving you ample time to chill and enjoy each other’s company. Access to the hut is a moderate half-mile of skinning up a snow-covered jeep road with breathtaking views. We use a snowmobile to tote in and out all the food, supplies and overnight equipment so your packs won’t be a burden. The terrain we use is moderate but fun and includes both alpine slopes above treeline with open glades and moderate tree skiing below. There are no requirements for previous avalanche education for this clinic simply because we’ll avoid avalanche prone slopes. However, this area is one of the best classrooms anywhere to learn about avalanche safety with some of the most impressive avalanche paths in the country will be visible in the distance. For women interested in taking a Level 1 avalanche course this clinic is the perfect warm-up. We’ll discuss how to find and interpret an avalanche forecast, the basics of using avalanche rescue equipment as well as how to perform daily transceiver checks and carry out a basic companion rescue. If you are an intermediate or even an expert skier or rider and curious about exploring the beauty and endless potential for untracked terrain, you’ll learn the skills on this clinic to help you do so. We’ll cover a wide range of topics including how a mountain snowpack forms, how to recognize and avoid avalanche terrain, navigating with a map and compass, decision-making and traveling in groups as well as how to manage clothing, temperature, and equipment in winter conditions. We’ll teach you how to skin uphill, make an efficient skin track and set a pace that you can maintain for any length of time. We’ll show you a number of different kick turns for the up, give you tips on how to conserve energy and make transitions from up to down more efficient. Backcountry conditions are typically variable and call for a wide range of tactics to ski or ride confidently and in control. You’ll come away from our clinic with tools to negotiate tricky conditions safely, both increasing your fun factor and reducing your risk of injury in the backcountry. You should be an intermediate to expert skier or rider with that ability to ski blue runs on-piste confidently and in control. No previous backcountry experience is required. For those that would like to delve more into backcountry skills who already have a few days under their belts, this clinic will take your skills to the next level. Day 1 8:00 a.m. meet at the Guide Garage in Ouray for light breakfast and coffee. After welcome and introductions we’ll discuss the clinic schedule, have a safety briefing, cover what you need to bring, check your equipment and provide any demo gear you’d like to use. We’ll demonstrate how to pack your backpack, cover what small personal items to pack for the snowmobile and what you should wear for the skin into the St Paul Lodge. After getting ourselves organized and ready to go we’ll take a van shuttle up to RMP for the short skin, 30-minute into the St Paul Lodge. Prior to leaving the trailhead, we’ll cover standard avalanche transceiver checks, function, and use. After checking into the Lodge, we’ll venture out for an afternoon tour covering skinning, touring basics and backcountry skiing skills as well as pacing and managing temperature and layers. We’ll do a thorough transceiver search (mock burial), that includes probing and shovel technique. After getting the lay of the land, some turns and reviewing these skills we’ll head back to the lodge for hot drinks, dinner, and some R&R. After dinner, we’ll have a discussion on the basics of avalanche safety and the mountain snowpack before reviewing the next day’s plan. Day 2 After a hearty breakfast at the St Paul Lodge we’ll learn how to read an avalanche forecast bulletin and talk about how to plan a backcountry tour. Then we’ll head out and do our standard transceiver checks before skinning up for the day’s tour. We’ll cover more terrain today and have the opportunity to really dive into some of the techniques for skinning, route finding, managing comfort in the winter environment and looking at the snowpack more closely. We’ll get into the meat of how to ski in control in the backcountry, managing variable conditions and find some freshies while we’re at it. We have the option of returning to the hut for lunch or staying out all day for a longer tour. After a hearty dinner, we’ll have a lesson on Map and Compass Navigation and review where we toured before discussing tomorrow’s plan and tucking in for the night. Day 3 After another hearty breakfast at the Lodge we’ll read the avalanche forecast bulletin and have a group tour planning exercise for the day’s outing. Again we can choose to stay out all day or return for lunch at the lodge. Mid-afternoon we’ll return to the lodge and pack up and ski back down to Red Mountain Pass for our van shuttle back down to Ouray where we’ll share high fives and happy hour Hors d’oeuvres at the Ouray Guides Garage.